Hello, everyone! 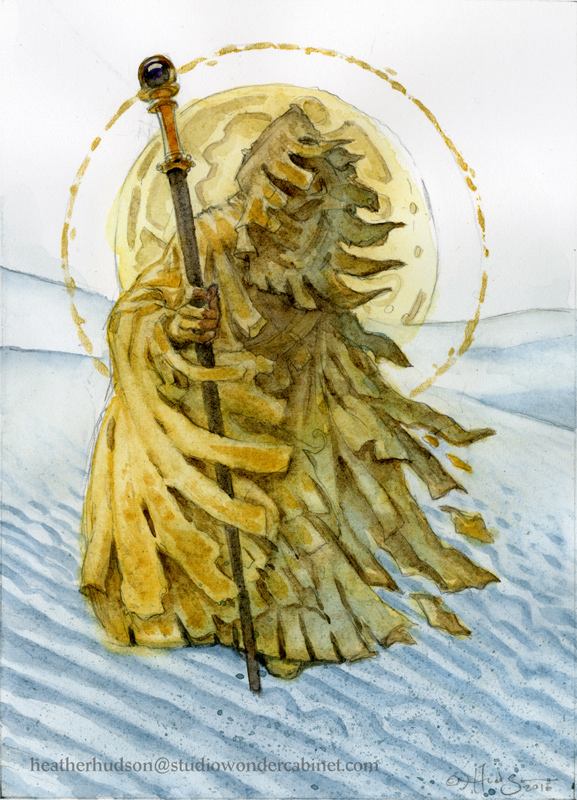 Greetings to new subscribers from the "King in Yellow Xmas" campaign! Thanks for wanting to hear more about my work! Our "King in Yellow Xmas" project is now complete. In the end, 468 backers pledged $10,733 to support our project. Rewards have been sent. I know many of you here are backers, and I wanted to thank you for being a part of our campaign and for enjoying our work - and for giving feedback when I have questions, that's appreciated too! The subject is Dreamlands! Actual title TBA, but definitely Dreamlands! Earlier! OMG, so much earlier! (Cuts out paragraph of explanations & excuses.) The 2017 Xmas card art is due to the Art Director (Daniel) on Sept 18th, and, barring meteor strike or more confusion with the KS website interface, the campaign should begin on Tuesday, Sept 26th. Now that I have told you, it's official and public-knowledge and I'm committed, and Things will Happen. Huzzah! So it is written, so let it be done! I painted five original watercolor sketches as rewards for the kickstarter. For this project I wanted to play with the texture of the paint on the paper, the emergence of form out of random texture echoed some of the feels of the text for me. And there's color! Last year I drew graphite sketches as rewards but this year I wanted to bring color into the artwork this time, what with "yellow" being a part of the project's name! 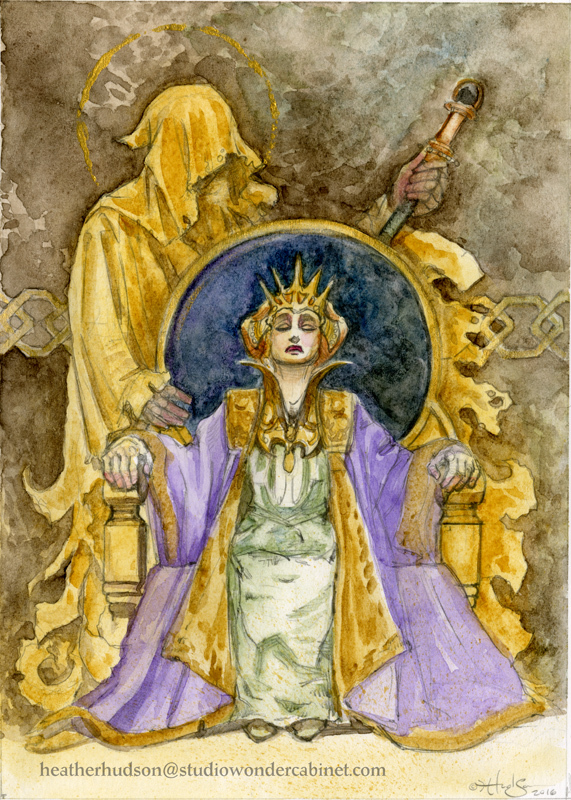 King and Queen - watercolor, graphite and metallic gold on watercolor paper, 5x7". Artwork © 2016, Heather Hudson. Blue Sand - watercolor, graphite and metallic gold on watercolor paper, 5x7". Artwork © 2016, Heather Hudson. 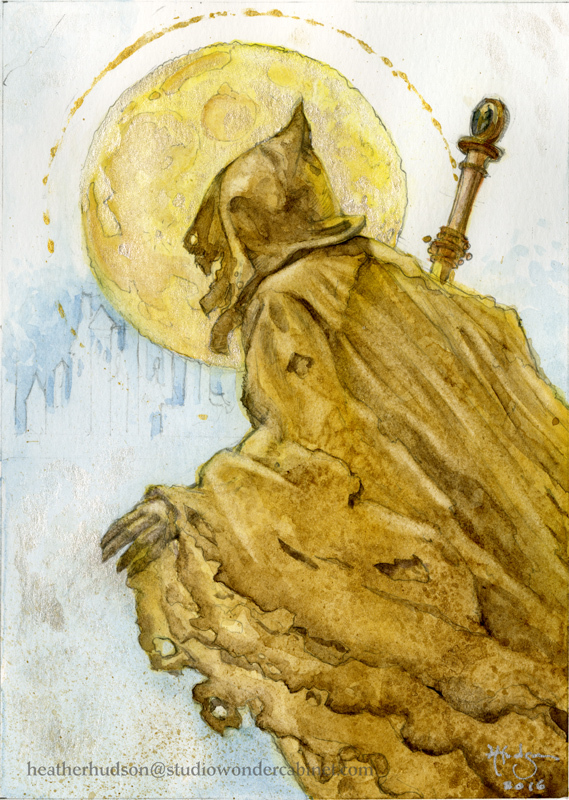 Before the Moon - watercolor, graphite and metallic gold on watercolor paper, 5x7". Artwork © 2016, Heather Hudson. 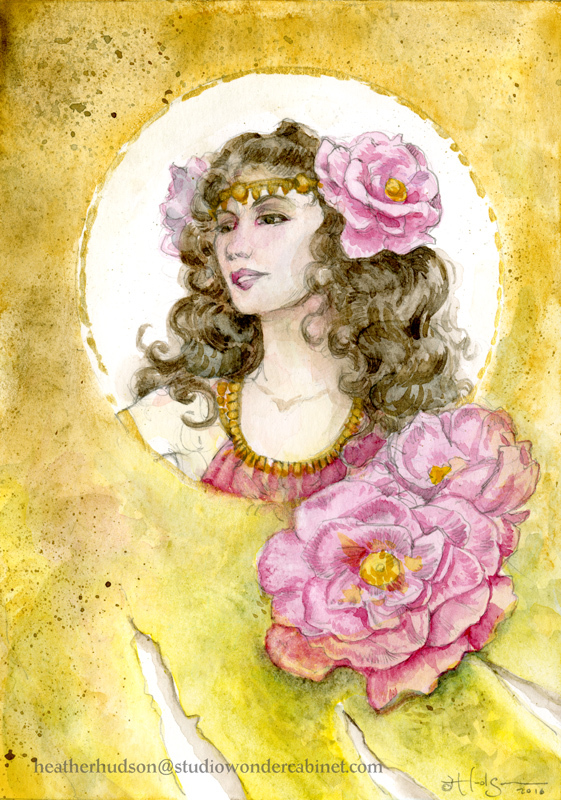 Camilla - watercolor, graphite and metallic gold on watercolor paper, 5x7". Artwork © 2016, Heather Hudson. 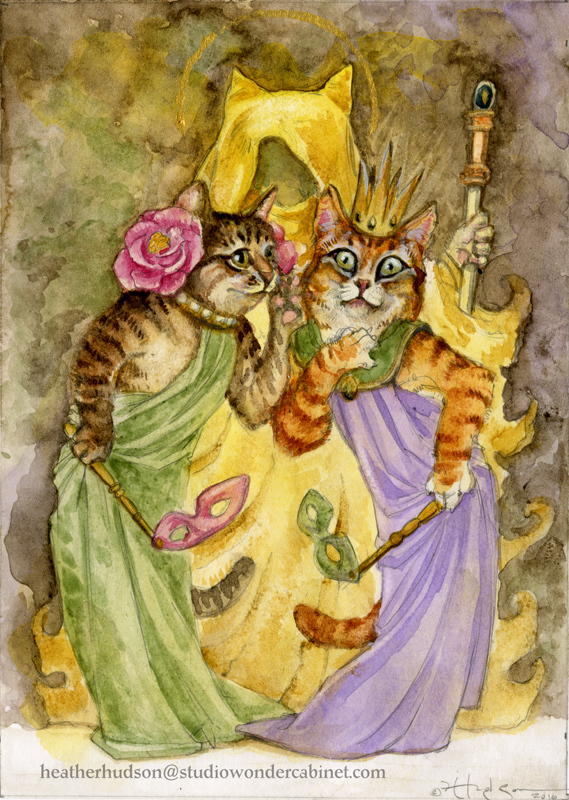 The Cats' King in Yellow (A Tribute to Louis Wain) - watercolor, graphite and metallic gold on watercolor paper, 5x7". Artwork © 2016, Heather Hudson. I'm working on a new sketchbook for spring to collect the best of the traditional art I've created this year, the working title is "Faes, Fates and Furies." 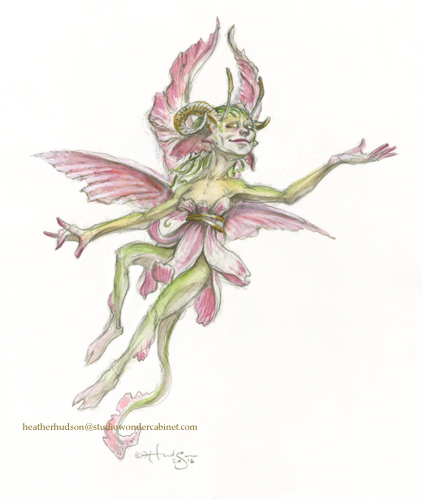 I'll print it soon so that I have it at the March conventions, and at least part of it will be in color; a color section will be a big investment for me but I'll be able to print my watercolor June Fae in their proper hues. Next month I'll show you a few pages from the book and share how to pre-order. This month's sketch isn't secret, just a bit neglected. 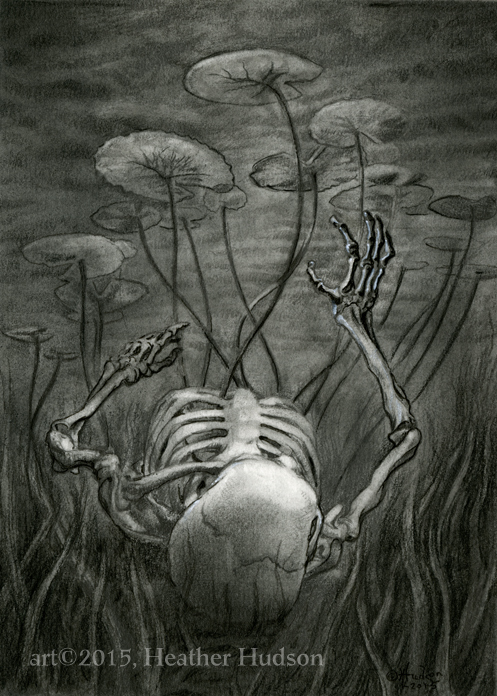 "Pond Weeds" is an original work from the 2015 Month of Fear challenge, available from everydayoriginal.com. You can read background thoughts on the work here on my site. I'd love it to find a home, particularly before mailing rates go up next year, so I've lowered the price to 90 USD, which includes framing and shipping to any place in the world. If you love it enough to buy it, let me know you're a subscriber and I'll draw you a special thank-you sketch/ note of authenticity in appreciation. One last thought - If you want to unsubscribe from this newsletter, there's a link in the footer. It's cool, Mailchimp and I respect your decision. In fact, we respect it so much that if you un-subscribe and then change your mind, I can't re-enter your name for you. Former subscribers must hunt down a link (on my website, in a shared newsletter, etc.) and click the buttons themselves. Alas, the nature of unsubscribing is such that the returning backer who asked to be added back to my mailing list won't be able read why he isn't getting my newsletter again. But I've put the information out in the world so perhaps it will get around. I'm a fantasy artist in Washington state, USA, with two cats, a husband and a one-person art business I call Studio Wondercabinet. If you're reading this, you probably signed up for my newsletter at a convention or during a Kickstarter campaign. Operation Gaia will be a fund-raiser for the Audubon Society, and will include many artists exhibiting with Changeling for the first time. It will start Friday evening, January 20th. Winged Things will be an assemblage of artwork celebrating all things winged, and will take place from 9 January 2017 at 12:00 to 13 January 2017 at 12:00, EST. This is a quicker event than many previous Changeling auctions (because of the Gaia benefit? ), you might want to put this one on the calendar. Copyright © 2016 Studio Wondercabinet, All rights reserved.